3 bedrooms, 2 full bathrooms, sleeps 8. This is considered by many to be one of the most beautiful locations on Mount Desert Island. 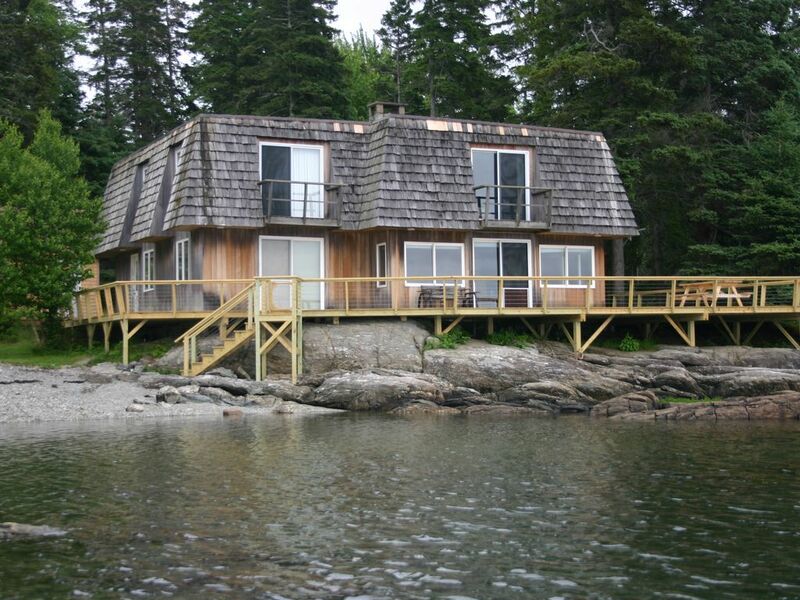 Located in the town of Bar Harbor, on protected Western Bay, our cottage sits so close to the ocean that water laps against the deck at high tide. The property is immediately adjacent to the Blagden Indian Point Preserve. Many visitors come to the Preserve to see the harbor seals basking in the sun at low tide. The best view of the seals is from our deck. With over a thousand feet of shoreline, we have a beach for convenient kayak access as well as picturesque rocky ledges. Private tennis court is located on the property. Located minutes away from Acadia National Park. Please do not bring jet-skis or other motorized water-craft. The low-tide resting area for the protected harbor seals is VERY close, and these types of vehicles will disturb them. The Blagden Preserve: The Cottage at Indian Point has over a thousand feet of shoreline, including two beaches as well as traditional Maine shoreline ledges. But if that's not enough, the Cottage is also immediately adjacent to the Blagden Preserve, which is part of the Nature Conservancy. This means that visitors to the Cottage have access to more than 1000 additional feet of shoreline, plus the miles of maintained walking/running trails on the Blagden Preserve. The forests of the Preserve include red spruce, northern white cedar, balsam fir, red oak, red maple and tamarak. Wildlife at the Cottage and on the Preserve include harbor seals, white-tailed deer, porcupines, ruby-crowned kinglets, osprey, loons, 6 woodpecker species, and as many as 12 species of warblers. Sports at the Cottage at Indian Point: Guests at the Cottage enjoy many athletic opportunities, such as kayaking, swimming (the bay becomes warm enough for swimming on particulary hot days of July and August). For tennis enthusiasts, there is a private tennis court (asphalt surface) on the property. A basketball standard is also available on the tennis court. Runners will enjoy the trails of the Blagden Preserve, as well as the low-traffic country roads on the western side of Mount Desert Island. Biking is also a popular activity (Bicycles not provided). Acadia National Park: Everett Cottage at Indian Point is only a few miles away from the Pretty Marsh picnic area, which is in the western portion of Acadia National Park. The more well-known parts of Acadia, like Sand Beach, Cadillac Mountain, and Thunder Hole, are approximately 12 miles away in the eastern part of the park. Renters should note that Bedroom 2 and Bedroom 3 are both located in loft areas. There is visual privacy in the lofts by way of curtains, but limited sound privacy. This is a wonderful family vacation spot, but due to the inherent dangers of the Maine coast, including slippery rocks and ledges, it may not be suitable for very small children. All renters should be able to swim. The property is located on a private road, which starts out paved and ends in gravel. The paved portion of the road has a high 'crown' in places which requires drivers of cars with low clearance to drive carefully. It is wise to observe the 10 mph speed limit. The private tennis court is located in a beautiful wooded area, and also includes a basketball standard for those who don't play tennis. This is why we came to Maine! Everett Cottage is ideally located to enable you to experience Maine, its beautiful wooded areas, wildlife (seals) and the food, shops and people of Bar Harbor in the summer. Although it seems somewhat remotely located, it accommodates both the active and more sedate vacationers of the group because the site provides activities and it is easy to get to the food, scenery and happenings of Mt. Desert Island from where you are.. The rental itself provided hiking opportunities and kayaks, plenty of comfortable beds and an adequately equipped kitchen. The house is older and could stand some TLC, to do general repair. Our party of six loved it and we will most likely gather together again and consider it as one of the locations we would look at as our location of choice. The location is beautiful and has a large amount of wildlife. We enjoyed the kayaks and canoe passing by The Ledge, Milliken Island, Green Island, The Reef all the way to Black Island all along observing seals and sea birds. I've never observed the tide change like at this location. I think it's about an 11 foot difference. Islands pop up then disappear throughout the day. We had good weather and were able to take advantage of the tennis court and hiking in the area along the coast and Blagden Preserve. The cottage is roomy and has everything we needed. As mentioned in other reviews it's somewhat dated but clean, comfortable and functional. Enjoyed the privacy and view from this property. The home itself is older. Could use a little TLC and updates. Only one real bedroom, other sleeping area is loft. We were disappointed that the indoor fireplace was not usable as we went mid October and would have enjoyed that. Owner was nice. We thoroughly enjoyed our stay here! Our two families (total of 8 people) stayed three nights. The location is absolutely lovely. We swam and kayaked right at the house. There are many, many seals in view and it is perfectly peaceful and quiet. The beds were comfortable and the house is pleasant and roomy, grill worked great, the kitchen had all the utensils we needed. We hope to return soon! We just returned from our week at Everett Cottage on Indian Point in Bar Harbor. What a wonderful, relaxing week! The cottage is fully equipped with everything you might need. All we had to do was bring in some groceries. Once we were unpacked, it just felt like home. There was a kayak and life jackets available for us to use, and our daughter had great fun kayaking along the shore. There were plenty of books and puzzles and games to choose from, and if you wanted to watch TV, that was available also. We enjoyed reading and just sitting on the deck in the evening listing to seals out on the rocks, and looking at the millions of stars in the sky. I have never seen a night sky like that before. It just took your breath away! The property is connected to the Blagden Indian Preserve. One day I walked down the shore onto the preserve, and followed one of the trails into the woods where I found two chairs and bench tucked among the bushes overlooking the water. It was so peaceful and relaxing. It is a bit of a drive through the woods to get to the cottage, but you never know what you'll see along the way. We saw three porcupines, and several deer eating apples in one of the of the old apple orchards. There are several other house around, but they are tucked away, and even though you pass a couple on the way to the cottage, you really feel like you're the only ones there. A high tide the water really does come up to the deck, and at low tide the harbor seals bask out on the rocks. The only sounds you hear are the waves lapping at the rocks, the grunting of the seals, the call of the seagulls and the occasional kayaker that paddles by. If you're looking for something more to do, there are several towns to poke around in, including Bar Harbor Village with all it's wonderful shops and restaurants. And of course no visit would be complete without a trip through Acadia National Park, with all it's grand sights, including a trip to the top of Cadillac Mountain where you can see for miles! All in all it was the best and most relaxing vacation, and we thank the Everett's so much for sharing their lovely home with us. This rustic house is located in a very beautiful location surrounded by natural beauty. Location of the house surrounded by woods and directly on a very tranquil body of water provides great beauty and serenity. Kayaks on the property are a wonderful plus for exploring the coastline, seals and loons. The house itself has a fine deck built directly above the water. Many of the rooms overlook or open out to the deck with nice views of the water. It is amazingly quiet. No motor boats or traffic noise. You travel about a mile through a woodland road to get to the house. Two suggestions: a little better care inside the house regarding maintance of light bulbs and renters should be told that two of the three bedrooms are really lofts without doors. The cottage is located within the town limits of Bar Harbor, but is NOT located inside the village itself. It is located at Indian Point on Western Bay, adjacent to the Blagden Preserve, which is about a 10-15 minute drive from either downtown Bar Harbor or Northeast Harbor.